When South Station opened, it covered Atlantic Avenue to the Fort Point Channel. Much has changed. When South Station opened in 1899, it had 28 tracks that sprawled from Atlantic Avenue to Fort Point Channel. Today, with only 13 tracks, trains idle outside the station while they wait for other trains to vacate berths, causing maddening delays. 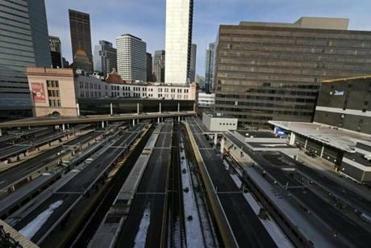 There are vocal critics of a South Station expansion. But on the governor’s lengthy list of what many view as pipe dreams and long shots, the South Station expansion is one being pushed hardest — and one that is considered more likely than most to succeed. Governor Deval Patrick’s South Station plans call for adding new tracks to the station’s existing 13, which would require relocating a US Postal Service facility currently on Dorchester Avenue. “It’s one of the stronger components of the plan,” said state Senator Robert Hedlund, a Weymouth Republican, who takes issue with many components of Patrick’s plan but said he knows that overcrowding at South Station is causing problems. Richard A. Davey, the state’s transportation secretary, said he believes the South Station project is one of the strongest and most persuasive elements of the plan. 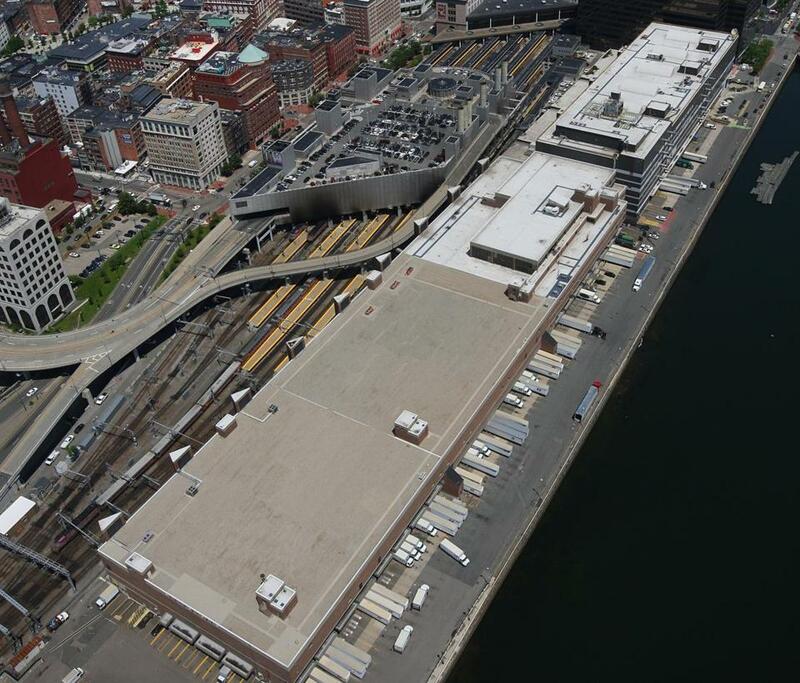 The governor’s South Station proposal calls for adding at least seven tracks to the station’s existing 13, requiring relocation of the adjacent US Postal Service’s General Mail Facility along Dorchester Avenue. It would reverse the tide after a century of thinning out at the train station. In 1912, before the era of the automobile and air travel, more than 1,000 trains arrived and departed daily from its tracks and platforms. In the 1960s, after the New Haven Railroad went bankrupt, the station was sold to the Boston Redevelopment Authority, which decided to sell part of the site to the postal service. The number of tracks was cut sharply. The governor’s proposal would reclaim that waterfront property. “It’s really back to the future for us,” Davey said. Richard A. Dimino, president of A Better City, an organization that addresses economic and quality-of-life issues in Boston, said the project would provide benefits to residents around the state. The proposed expansion would allow new service options — such as trains to Worcester, the South Coast Rail to Fall River and New Bedford, and a railroad to Cape Cod. Rapid-transit service along commuter rail lines would also be possible. Expanding South Station has been discussed for decades. In 2010, the US Department of Transportation awarded the state a $32.5 million grant to produce design plans on a possible expansion. Currently, those plans are in environmental review. An expansion would reduce delays by allowing more trains into the station to pick up passengers, particularly at rush hour when many trains converge, Davey said. Preliminary renderings of anticipated development on Atlantic Avenue and over the existing rail station. Amtrak and the Massachusetts Bay Commuter Railroad Co. have also expressed support for the project, saying the added tracks would help them provide faster service and more options. The traffic jam of commuter rail and Amtrak trains “requires precision scheduling and expert execution,” said Hugh Kiley, general manager of the commuter rail, and if one thing goes wrong, a wave of delays among other routes often follows. 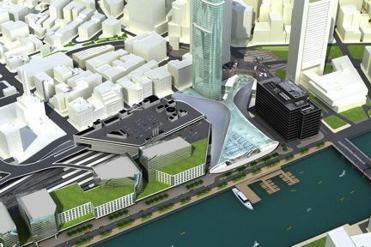 “There’s very little room to have a total operating plan in South Station,” Kiley said. Paul Regan, executive director of the MBTA Advisory Board, a coalition of cities and towns served by the T, said he takes issue with the fact that the plan is listed under the expansion portion of the governor’s transportation plan, because he said the station’s improvements are needed now. “It’s a critical project,” Regan said. There could also be economic benefits to the plan. Kairos Shen, chief planner at the Boston Redevelopment Authority, said increased train service at South Station could help to increase economic activity in the neighborhood, increasing access to burgeoning business growth downtown and in the South Boston seaport district, while also making those areas a more attractive option for new businesses. Dorchester Avenue would once again run all the way to Summer Street. At a meeting of Move Massachusetts on Friday morning, where Davey spoke about the specifics of the governor’s plan, some used their questions to criticize the state’s decision to hold off on building a north-south rail link that would connect South Station and North Station. Hedlund said the idea of South Station expansion has been discussed for more than two decades, and he’s seen the need himself — trains racked with delays as they bottleneck at the South Station terminal. In many ways, he said, he’s skeptical about the governor’s transportation plan — he called the South Coast Rail a “boondoggle” — and maintained that several of the items in the governor’s plan were political moves or gifts for the state. But South Station, he says, feels more necessary than most other proposed projects. “We’re going to have to have a debate, and if you don’t have that revenue, or if you only have a portion of that revenue, all these transportation projects will need to be prioritized,” he said. Martine Powers can be reached at mpowers@globe. com. Follow her on Twitter @martinepowers.